The American Staffordshire Terrier is often confused with the PitBull because of the close resemblance they bear with each other. But this is where the similarities end. Although muscular, the American Staffordshire Terrier is also very agile. The American Staffordshire Terrier is believed to have come from mixing the White English Terrier (now extinct) and the Bulldog together. This has produced a very robust dog. Further selective breeding has produced not only a very muscular dog but also a very agile dog with very fast reflexes and speed. The American Staffordshire Terrier is a very muscular dog with a sturdily built body. He also possesses a square head and a somewhat shortened muzzle. One thing that separates them from PitBulls is that although they are muscular, they are also very agile. An American Staffordshire Terrier should exude an air of strength and balance at all times regardless of his bulky physique. The American Staffordshire Terrier likes to have something to do. If you give him a job, he’ll be happy to perform it. this helps make the American Staffordshire Terrier become a perfect family member. The American Staffordshire Terrier is a very loyal dog and is very protective of his family which makes him an excellent guard dog. Proper socialization should be practiced to ensure that he does not display outward signs of hostility to other pets and human visitors. The American Staffordshire Terrier is a very energetic dog owing to his ancestors genes so you need to give him plenty of exercise. A lack of exercise could make your American Staffordshire Terrier obese or worse, bored and destructive. Sadly, the American Staffordshire Terrier also suffer from ailments that his look alike suffers from. Among those ailments are congenital heart failure and hip dysplasia. This can be prevented with a proper diet and enough exercise. 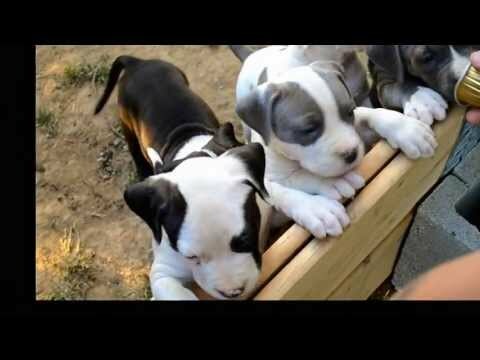 3 American Staffordshire Terrier puppies for sale near you. The American Staffordshire Terriers dogs puppies for sale have the muscular, stocky physique of a tried and true warrior. Its powerful head demands the respect of a celebrated gladiator. These puppies are fierce and intimidating in statue, but are the essence of the family dog and loving companion. The American Staffordshire Terriers have been painstakingly bred for the last fifty years to enhance it historically fierce appearance and bring about an affectionate, gentle, loving family member. The American Staffordshire Terrier is the descendant of English bulldogs and a various terriers. The Staffordshire Bullterrier was the result of the English breeders. The breed was embraced by Americans in the nineteenth century and brought to America. Once, in America, the breed was bred to have a broader and more authoritative head. They were also enhanced in size by the breeders. This breeding plan produced the now infamous strain, the American bull terrier aka the pit bull. This strains breeders were concentrated on a powerfully fierce dog and not so interested in the gentle qualities. About fifty years ago a conscientious group of American breeders started a movement to reinstate the loving qualities of this breed through deliberate breeding practices. The American Staffordshire Terriers dogs for sale are the result of these efforts. These dogs are a wonderful mix of power and tenderness. The American Staffordshire Terrier is a â€œfamily dog good with children and adults, affectionate and loyal. They are a runners dream dog; stamina and agility is a mainstay of their makeup. Like most terriers they may become hard to handle without a consistent regiment of exercise. Hard to handle, meaning that the ball of energy will never stop bouncing. 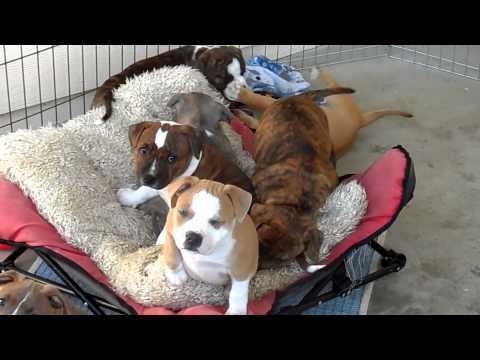 Exercise and a loving owner should ensure any residential environment would be suitable one for these American Staffordshire Terrier dogs puppies for sale. 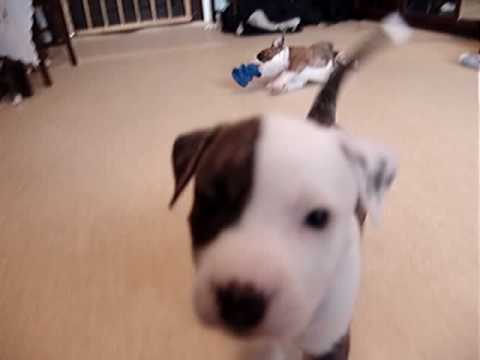 There are some communities that dont allow American bullterriers, the Staffordshirelook alike cousin, so make sure you have documentation of your American Staffordshire Terrier puppy. 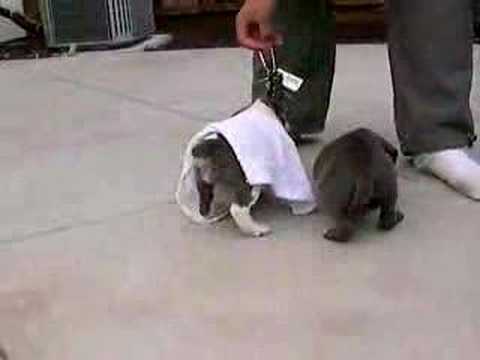 The breed can weigh up to sixty-seven pound and be as tall as nineteen inches. Their size and fierce looking body type can be deterring intruders alone. If it is does not, then the breeds agility and loyalty to their owner most certainly will. The dogs are also used in agility shows. They love to pull which is a wonderful thing when you have a skateboard, rollerblades or a cart and a harness. The dogs affection is an only outdone by its strength. The breed has a pretty rough health record. Hip dysplasia, heart disease, cataracts, skin and thyroid problems. However, they have a life expectancy of about fifteen years which is surprising for this larger breed. Litters are on average five to ten puppies. The dogs puppies for sale come in many different colors. Their coats are smooth and stiff. They require little effort as far as grooming. If you rub the breeds coat with a towel it will gleam. The American Staffordshire Terriers for sale extremely love, and pound for pound the best, alert companion you could ever want and a promising family member. This is a nice way to make your life easier and save time searching for your American Staffordshire Terrier dog’s puppy for sale. Once your email alert is put in place, all you have to do is check your emails regularly! You can create several email alerts, should you wish to do so.